Join 17,000 other Cornellians who receive the award-winning Cornell Alumni Magazine by paying class dues! Parents: Click here for your subscription options. 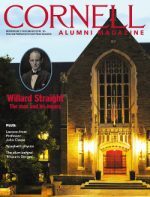 Cornell Alumni Magazine was founded by alumni in 1899 and has been sustained and supported by alumni ever since. Published bi-monthly, it connects alumni, students, faculty, and parents to the University. Each issue has 100 pages of engaging stories, in-depth features, Class Notes, short profiles about Cornell and Cornellians, Big Red Sports, alumni publications, and more.